In my estimation, there is exactly one reason to spend additional time at Newark Liberty Airport (EWR). Hint, it’s not to spend time in the Terminal A waiting area. Virgin Atlantic, which launched its very first route between London and Newark, operates a compact but mighty version if its famed Clubhouse at EWR. While the Virgin Atlantic Clubhouse Newark does not feature many of the staple perks of other clubhouses — complimentary haircuts and spa treatments, game rooms, hot tub — it features two delightful services that make it a worthwhile venture. Virgin’s a la carte dining and a spectacular cocktail bar may be just about the only thing at EWR worthy of an early departure from your New York City apartment or hotel. You shouldn’t miss out. Virgin’s once daily transatlantic service departs Newark’s International Terminal B wing. The airline shares the wing with Aer Lingus, Air India, British Airways and La Compagnie. Virgin Atlantic shares an upstairs lounge wing with a British Airways Galleries Club, serving both British Airways and Aer Lingus business class and elite passengers. The Virgin Clubhouse is accessible to business and elite passengers on Virgin’s once daily flight, and Air India’s service to Mumbai and London-Ahmedabad. Delta Platinum and Diamond Medallion elites travelling in economy or premium economy on Virgin Atlantic’s flight can also access the clubhouse. It is unclear whether Gold Medallions also have access to the Newark clubhouse (they no longer do in London), though given the limited waiting options it wouldn’t surprise me to see Virgin let a Gold Medallion in. The spectacular clubhouse entrance comes after an elevator ride, and feels more Galactic than Atlantic. Unlike most airline clubs, Virgin’s clubhouses favor full service over the often unseemly and unsanitary buffet setup that has become all to common. All of the clubhouses have the feeling of a first class lounge over a business class lounge, and Newark is no exception. The Newark Clubhouse has a nice diversity of seating, and was not crowded leading up to the departure of VS2 to London Heathrow. It feels more like a first class lounge than a business class or elite lounge. Image by John Harper. The lounge is Virgin’s most compact, but still offers a variety of cozy seating areas. Food can be ordered throughout the lounge and at the bar. Virgin’s Clubhouse Bar is beyond great. Virgin’s Clubhouse bars are always great. The one in Newark was no exception. Guests can peruse four full pages of aperitifs, liqueurs and specialty cocktails, as well as a beer and wine list. Everything is complimentary. Shame, Delta. We see you chargingn your premium guests for decent cocktails at the Sky Club. Shame, shame. The VX Clubhouse cocktail list was as exciting as it was expansive. Beyond having an absolutely tantalizing selection of cocktails — there were no fewer than 20 gin cocktail specialities on order, in addition to a whole list of classics and exotic drinks — Virgin employs truly talented bartenders. Both cocktails I ordered, a gin martini and specialty gin and Chartreuse combo called an Alaska, were impeccable. The Alaska was an incredible cocktail, a beautiful gold color, laced with Chartreuse. Virgin’s Newark Clubhouse bar will easily best many chest pounding Manhattan watering holes. Did I mention there’s no tab? Yeah, it’s all on the house. While a la carte dining here is not as extensive as it as at Virgin’s other clubhouses, the menu was adequate. Guests can mix and match starters and entrees (feel free to order more than one). As with the bar list, the entire menu is complimentary. The VS Clubhouse Newark has a smaller menu than other clubhouses, but still featured a nice range of dinner selections. The house greens I ordered were fantastically fresh and well presented. Crisp arugula adequately dressed in a tangy citrus vinaigrette. Freshly grated parmesan. Smile. This might be the best salad I’ve ever had at an airport. Not wanting to get too heavy on the cream and cholesterol before my overnight chair nap, I landed on the Clubhouse Mushroom Burger. The burger came out about 5 minutes after I finished my salad. The portabello was crisp, avoiding sogginess that often plagues these burger impersonators. Produce was fresh and the sauce was a tangy ketchup rendition. The only thing a bit lacking in this presentation were the buns, which seemed fresh off the white bread part of a supermarket aisle. The mushroom burger was well crisped and the bespoke ketchup was tasty. The fries were tasty enough. 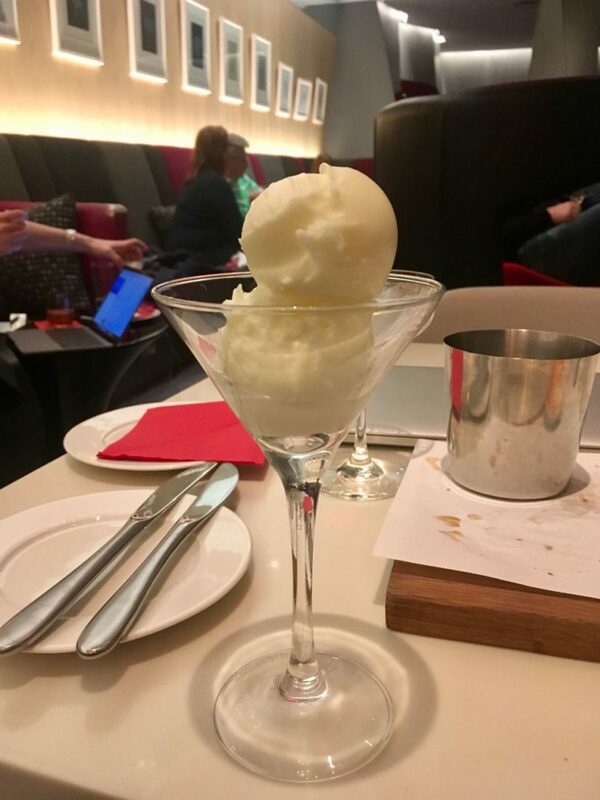 As I was finishing up, I noticed a guy seated across from me order a mojito sorbetto. I flagged down a lounge attendant with a, “can I get one of those, too,” grin. An absolutely delicious concoction appeared moments later. The sorbet wasn’t on the menu. Call it a well-kept secret. Equally satisfying, I got up to board my flight without having to so much as sign a check. Tips can be left in cash, of course, but given the predominantly U.K. clientel here it didn’t seem they were expected. The clubhouse featured a dining area, a screening area with several large monitors showing sporting events and news, a selection of newspapers including The New York Times, Wall Street Journal and Financial Times. There were also several shower suites, with classy showers and top shelf amenities. I loved the red accents inside the shower suites. There likely aren’t many long-haul connections being made here, but for those getting off of a hectic day at work, or transiting from an inbound Delta flight, the showers are a great amenity to relax and freshen up before a transatlantic flight. Virgin Atlantic really has the lounge game down pat. The Newark clubhouse is the smallest of the lot, but is still a bubble of loveliness to enjoy before a flight. Richard Branson seems to understand customer experience in a way that few other corporate executives do. The clubhouses are a reflection of that wisdom. Stepping out of a space like this completely reframes the entire flight experience. I was sitting in premium economy on my red-eye flight, but the experience felt truly first class.